This mine closed at about the time of the writing of this article. Lead and copper were mined here but arsenic and silver were also found. The earliest allusion to Britain in history is in connection with its mines. Our own historical mining records run back century after century, and show, by the regulations made for the government of the Stannaries (i. e. the districts which contained the tin mines), that long before the date of the earliest Stannary Charter now extant, that of John, granted in 1201, tin mining in Devon and in Cornwall was an occupation so settled and so organized as to have its well-defined and acknowledged laws and customs. Diodorus Siculus, Strabo, and Herodotus, by their references enable us to carry it back at least 2300 years. Inference from the use of bronze weapons in Europe, for which the West of England was the sole source of tin, takes it nearly 2000 years farther. But the geological evidence presented by the ancient tin stream works at Camon and Pentewan in Cornwall would antedate the commencement of mining, and consequently the use of metals, to a time when the mammoth either still existed in the West of England, or had not long disappeared ; and when the general level of Devon and Cornwall was at the least 30 feet higher than it is now. Tin mining is carried on in two ways. The ore occurs either in veins in the rock i.e. in lodes ; or in the form of pebbles, gravel or sand, in alluvium, in the beds of streams, or on moorland bottoms. These detritcd deposits have been formed from the degradation of surface lodes, and the washing out of their contents. The specific gravity of tin ore is so high - 6*8 - that as the carrying forces of the waters by which it was swept along moderated, it was the first thing to sink to the bottom, and was thus thrown down in beds, more or less mixed with extraneous matter. The lodes in which the ores of tin, copper, lead, and other metals occur are essentially fissures riven in the rocks, which have been filled with various minerals, earthy or metallic. Some lodes have been opened and have received fresh deposits more than once. The sides of these fissures are called the "walls" of the lode, and the rock enclosing it the " country. '* Lodes are more or less perpendicular, the inclination being called the underlie. Tin ore is also sometimes disseminated through the body of a rock in strings and clusters of little veins ; and again some ores lie in beds or pockets. As tin ore occurs mainly in two different ways, so have there been two methods of obtaining it. The one is "streaming" - in which the alluvial tin deposit is subjected to the action of water, and the tinny matter washed out and separated. For centuries this was the only way in which tin was raised in this country, and there is hardly a valley on Dartmoor that has not been streamed over and over again, by the " old men," as the ancient miners are popularly called. Streaming now is all but extinct in Cornwall ; and in Devon wholly so. Lode mining is carried on by means of shafts, and levels or galleries driven on the course of the lode, the object being to raise as much that is valuable and as little that is worthless as possible. When the ore, whatever it may be, is at " grass " (i.e. surface), it has to be submitted to a series of operations, known as dressing, the object of which is to separate it from the various impurities — chiefly the mechanical — with which it is associated. The chemicals are for the most part dealt with by the smelter. Dressing operations vary in character with the ore treated, and are singularly interesting. The chief mining district of Devon is in the vicinity of Tavistock. Mineral lodes occur, however, in almost every part of Dartmoor, and are worked upon at various points. There are likewise mines in the north of the county. Lodes near the junction of the granite and the " killas " or clay slate are commonly the most productive. The deepest mine now worked in the West of England is Dolcoath tin mine. near Camborne, the deepest point of which is over 400 fathoms, or 2400 feet from surface, very little short of half a mile. All the leading metals have been extensively raised in Devon. Tin mining in the county is, however, but a shadow of its former self, and copper mining, which does not date back more than a century and a half, has taken its place. Lead was worked in the county even during the Roman occupation ; and the lead mines of Beer Alston and of Combe Martin were wrought for the silver contained in the lead ore in the time of Edward I. 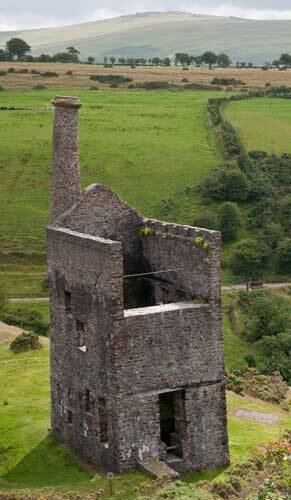 The iron mines of Devon are very widely distributed, though almost undeveloped. Large quantities were raised in far back antiquity in South. Devon by the simple process of sinking shallow pits, and when one was exhausted, sinking another. The ore is supposed to have been smelted on the spot. Good examples of the pits occur about four miles from Honiton, taking the road through Combe Raleigh. The great bulk of the arsenic produced in England comes from Devon Consols mines and the works adjoining, on the other side of the Tamar, where it is obtained by calcining the arsenical pyrites ; and Devon is almost the sole source of the manganese supply of the kingdom. Gold has been found, though not in commercial quantities ; but silver has been yielded by the lead ores to the amount of 140 ounces to a ton and above, and has occurred also independently. Antimony, cobalt, bismuth, and zinc ores have been raised in commercial quantities. But the mineral products of Devon are by no means confined to the metals. Its rocks yield building stones of considerable local value, while the Dartmoor granites have been extensively worked and exported; and the cretaceous-free stone of Beer was the great rival of Caen stone in the West in the middle ages. The ornamental stones of Devon are of considerable importance, notably the marbles of Plymouth, Ipplepen, and Torquay, which bear a high polish, and are most varied in colour and " figure." Some of the granites are very handsome, especially the rich red of Trowlesworthy. Rock crystals, calcedonies, jaspers, agates, and cornelians are found of sufficient value to be worked up by local lapidaries, who also adapt some of the fossil marbles to purposes of personal adornment. The clays of Devon are valuable commercial products ; the most important are the clays of Bovey and Newton Abhot, the china clays of Dartmoor, and the terra-cotta clays of Torquay. China clay is simply the decomposed felspar of granite which has been acted upon by an agency as yet little understood. Deposits of granite thus disintegrated occur largely in Cornwall, in the vicinity of St Austell, and on various parts of Dartmoor. Ihe largest clay works are at Lee Moor, which may be reached either from Cornwood or Plympton , and are between 5 and 6m. distant from these stations.